The old swung it. There’s no mystery about why Exit triumphed; it had its core vote among the over 65s, among the generation who could remember Biggles and Baked Beans and when diversity on TV was the Black and White Minstrel Show. Of those young people who voted, three-quarters voted to remain but a greater proportion of the old actually voted and it is their greater turnout which explains why exit won. You could, if you wanted to, blame the young for not voting in even large numbers. But who with their heart beating could vote happily for the Europe of Schauble and Merkel, the Europe that imposed water charges on Ireland, the Europe that forced bankruptcy on Greece? The main organisations of the British left have hardly covered themselves with glory in recent weeks. A year ago they said that UKIP was an existential threat to socialists and demanded that everyone unite with them against its threat. This week, they were not Standing up to Ukip but Voting with Farage. All the rest of us still defer far too much to them. The new left says “Defend” – starting with the rights of the EU migrants which are now in jeopardy. This is a humane and necessary response. 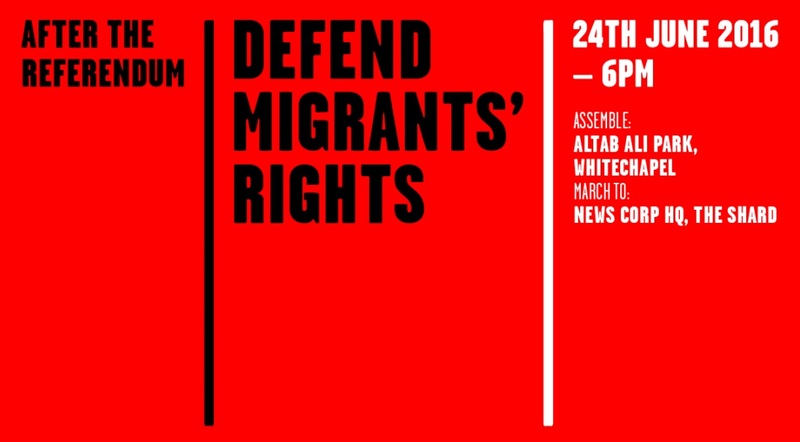 I will be part of it, starting with the first protest for migrants’ rights this very evening. But the referendum shows us that the will to protect what we have is insufficient. It felt as if remain was saying “we have enough rights now”. This was a weaker and more defensive argument. How could the poor be better off than they were already? Even those of us who argued for left remain positions could not say that “voting with us will make things better”, only that it would not make life worse. The British population has grown in sixty years by 20%. Let us concede the possibility that to host 20% more people you need 20% more houses, 20% more jobs, 20% more cars. In the same period, GDP has grown, not by 20 or 25% but by 2500%. There are more than enough resources to go around. Limiting benefits by nationality is not a strategy to maintain the welfare state but to surrender it. This is the argument the left needs to win, and we can only do it in the same way as previous generations: by making demands and winning them and showing that it is possible without racism to win more for those without. A hundred years ago, people argued for pensions, for benefits for the unemployed. With each reform that was won, people’s ambitions for the future were raised. The task in our own time is to show, as Corbyn briefly argued a year ago, that the homes of the landlords are not theirs for life but can be returned to the people who rent. To restore the corporations and the rich to the tax system, which they have been allowed to escape. For a universal basic income, available to all irrespective of nationality. Only if the left learns to defend less, and demand more, will we avoid more wretched mornings like this one.